It was a simple tap-in from a routine cross that brought the 20-year curse to an end. Fabio Quagliarella, the man famous for outrageously beautiful and inventive finishes, scored one of the most “boring” goals of his career to gift Torino their first derby win over Juventus since April 1995, and that was probably even more surprising than the result itself. Brazilian right-back Bruno Peres scored a stunning goal for Torino in the previous derby in November – their first versus Juve since 2002 – and one would have expected Quagliarella to produce something equally remarkable. After all, that’s what the 32-year-old has been doing throughout a career that has taken him to Ascoli, Sampdoria, Udinese, Napoli, and eventually Juventus themselves. The range of Quag’s skills is absolutely sensational. Name your favourite type of goals – he has done it all. A lob from 40 meters? No problem. A thunderbolt into the top corner? Take that one. Or maybe this one is even better. A bycicle kick? Here you go! No, this is actually might be superior. A deft chip over the keeper? As you please. A back heel? Of course. How about a rabona? Thanks for asking. How Torino must wish the veteran could have spent his entire career with them. Born in the suburbs of Naples, Quagliarella travelled north at the tender age of 11 to join Torino’s academy, where he was long considered one of the very best prospects. He made his debut as a 17-year-old, and after a few successful loan spells in the lower divisions contributed significantly to Torino’s promotion from Serie B in 2005. Unfortunately, a good season on the pitch coincided with a dreadful financial crisis under the unpopular president Attilio Romero, the man infamous for the fatal car accident that claimed the life of the great Torino star Gigi Meroni in 1967. The club was declared bankrupt, the promotion was cancelled, and that meant that most of the players had to be released, including Quagliarella. And thus he showed his talents elsewhere. Sampdoria and Udinese fans worshipped him, and in 2009 he fulfilled a dream of playing for the club he supported as a kid when Napoli signed him. Given his extraordinary skills, Quagliarella really should have been much better known around the globe, but some unfortunate coaching decisions cost him dearly. A promising career in Italy’s national team seemed to be certain for Fabio, after he scored an important brace of beautiful goals away to Lithuania in a crucial Euro 2008 qualifier. However, Roberto Donadoni barely used him in the tournament itself, and a similar scenario followed two years later at the World Cup South Africa. Despite arriving in top form, Quagliarella was controversially benched by Marcelo Lippi, forced to watch impatiently as his team-mates struggled mightily against Paraguay and New Zealand. Finally, when Squadra Azzurra ran into desperate trouble against Slovakiain the final fixture at the group stage, the striker was introduced at half-time and changed everything. Quagliarella was easily the best Italian on the pitch, full of improvisation and stamina, and he scored a majestic goal in injury time, but that wasn’t enough to prevent the 3-2 defeat and the bizarre elimination. He cried desperately on the pitch, distraught that his time at the biggest scene was limited to just 45 minutes. That was a huge shame. Another disappointment awaited Quagliarella in the summer of 2010, as Napoli signed the Uruguayan star Edinson Cavani, forcing him to leave the club he loved. The striker signed for Juventus, who were underachieving ever since returning to Serie A in 2007, and nearly turned their fortunes around. Quagliarella was brilliant in the first half of the season with nine goals in 17 league fixtures, leading Juve to a sensational win against Milan at the San Siro, but then he tragically tore his knee ligaments in January. Without him, the Bianconeri finished seventh. Antonio Conte changed everything, and turned Juventus from losers into the ultimate winners. Quagliarella won three Serie A titles thanks to him, but at the same time got much less playing time at the club, who gradually decided that he was simply not good enough for them. That was quite unfair, and Quagliarella was adamant to fight for his place. In 2013, he refused lucrative financial offers, including the one from Al Gharafa in Qatar, but eventually saw his involvement at Juventus limited to a minimum following the arrivals of Carlos Tevez and Fernando Llorente. Last summer it was clear that leaving was the only option. Quagliarella didn’t want to move to another city, however, and signing for Torino made sense. The Granata had just sold Serie A top scorer Ciro Immobile to Borussia Dortmund, while tricky winger Alessio Cerci moved to Atletico Madrid. They needed someone who would provide the goals of the former and the improvisation of the latter. The prodigal son returned – fitting the bill on both counts. The start was a little slow, but once Quagliarella and wise coach Giampiero Ventura developed mutual understanding, the team became unstoppable, climbing to the top half of the table. That is why there was a significant optimism ahead of the derby last Sunday – Torino fans believed that breaking the curse was indeed finally possible. Naturally, the coach who masterminded the last derby win was a popular interviewee ahead of the fixture. Nedo Sonetti managed to beat Juventus not once but twice in the 1994-95 season. The Bianconeri were brilliant that season under Lippi, claiming the title with ease, but they succumbed to their city rivals on both occasions. Ruggiero Rizzitelli, the burly striker who went on to star for Bayern Munich later in his career, scored a brace in the 3-2 win in the first round, when Fabrizio Ravanelli missed a penalty, and netted twice again in April as Torino won 2-1. Quagliarella watched those games as a 12-year-old student in Torino’s academy, and dreamed of following in Rizzitelli’s footsteps. According to Sonetti, he had that chance now. Talking to La Repubblica newspaper, the former coach said: “Rizzitelli was playing alongside quality team-mates, like Jocelyn Angloma and above all Abedi Pele. Together they could do great things, and today Ventura has someone who can emulate them in Quagliarella. Rizzitelli scored 19 goals that season, and he was more powerful compared to Quagliarella, but Fabio is more agile. I see similarities in the ways they find spaces in the box, looking for the goal”. Sonetti was absolutely right, and Quagliarella’s dream came true. Andrea Pirlo scored the opener for Juventus with a trademark free kick, but Fabio assisted Matteo Darmian on the stroke of half time, and then Darmian returned the favour with the cross that was converted into a winner. It wasn’t spectacular by any means, and it probably should have been (an overhead kick attempt went just wide later on), but who cares? That was Quagliarella’s 13th goal in Serie A, equalling his own record from 2007 and 2009, and he will almost certainly break it this month to make 2014-15 his best season. He has come full circle to find happiness at the club where it all began, and fans adore him, just like anywhere he played before. That means that we can expect more outrageous efforts from the virtuoso of Italy. Every lover of pure football can only be delighted to see Quagliarella enjoying himself on the pitch again. 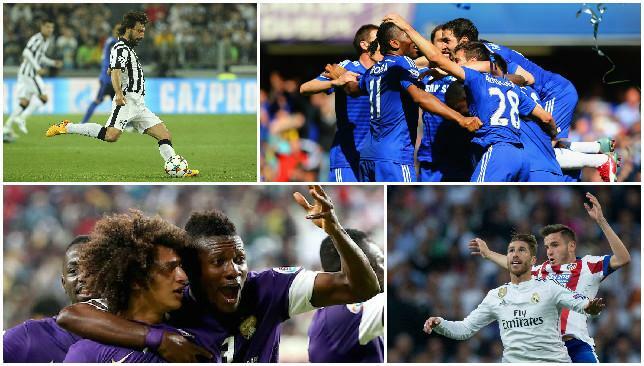 Ahead of the class: Chelsea, Juventus and Al Ain have been dominant this season. In this week’s #360podcast, we discuss Chelsea, Juventus and Al Ain’s respective League title triumphs, as well as a look ahead to the Champions League semi-finals and the penultimate weekend of AGL action. 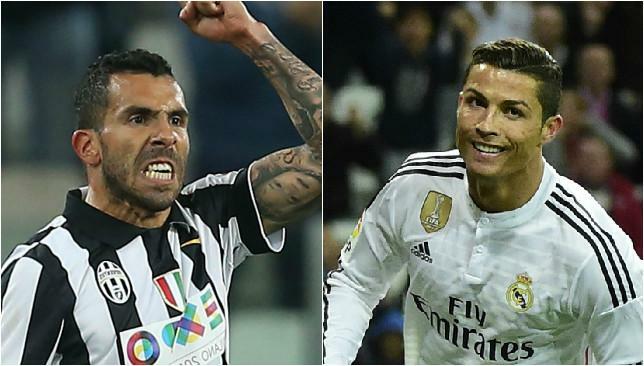 Carlos Tevez's Juve face Cristiano Ronaldo's Real. Carlo Ancelotti is considering fielding Isco as an emergency centre forward for Real Madrid in tonight’s Champions League semi-final trip to Juventus after Karim Benzema was ruled out. Benzema has been absent for three weeks with a knee injury, and Ancelotti’s hopes that he would return in time for the game in Italy were thwarted when the French frontman was left out of the travelling party. Although Javier Hernandez initially compensated for the loss of Benzema with three goals in two games – including the quarter-final winner against Atletico – the Mexican striker has been subdued more recently, failing to score in his last two outings. And considering Isco’s greater ability to link the play, Ancelotti may well opt for the young Spanish international in a deep-lying forward role similar to the position occupied by Lionel Messi at Barcelona in recent years. Isco has played several games as a ‘false nine’ over the last couple of years, and Ancelotti hinted that he may opt for his game-building skills ahead of the more predatory Hernandez again tonight. However, Ancelotti was also at pains to emphasise that he still has confidence in Hernandez, adding: “He has helped us a lot and we’re here partly because of him. Another big selection call for Ancelotti is in midfield, where he must decide whether to again move Sergio Ramos from his usual centre back position to partner German international Toni Kroos. Although Juve’s Serie A title challenge has been built upon the foundations of a superb defensive record, Ancelotti dismissed suggestions that the upcoming tie will be a similarly attritional encounter to the quarter-final clash with Atletico, another strong defensive outfit. Ancelotti also believes his side’s last-eight victory over Atletico – which included a goalless away draw in the first leg – shows that scoring an away goal, often perceived as crucial, is not necessarily a vital part of his team’s job tonight. Juventus playmaker Andrea Pirlo has hailed Real Madrid as the “most important club side in the world”, but insists his team will face the holders without fear. Pirlo, who has played in seven European semi-finals and won the Champions League title twice at AC Milan under current Real coach Ancelotti, knows the Spaniards must be respected. The 35-year-old said: “Real are the most important club in the world. They have a lot of experience in this type of games and have a team of champions. “We weren’t ready for the Champions League in previous years. But this team has gained experience and we know we can do well and play without fear. Now that we are here, we want to go all the way. To win it would be a dream come true, for me and for my team-mates. The big Basque striker scored in the group stages against Madrid last season and his powerful presence and ability from set pieces should earn him the nod ahead of Alvaro Morata. The 30-year-old always seemed to enjoy playing against Real during his time at Athletic Bilbao. Ronaldo, understandably, hogged the attention post-Sevilla after his hat-trick but there was an encouraging 24-minute cameo from Bale after his calf injury. The Welshman came alive in last year’s semi-final against Bayern and seems to enjoy the big occasion.